Kenmare News | Aileen is a true maiden! Aileen is a true maiden! Aileen Crean O’Brien pictured with the Polar Maidens! 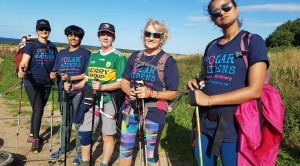 Aileen was filmed last month training with the Polar Maidens for their Expedition to the South Pole this December where they will complete Tom Creans journey to the South Pole, an incredible 150miles.